I’ve never been one for pancakes and omelets. I’m a fan of cultural breakfasts. I remember eating a traditional Japanese breakfast at a hotel overlooking a zen garden in Tokyo. And then the next day, eating sashimi with beer for breakfast at 7 a.m. at the Tsukiji Wholesale Fish Market. (When in Tokyo…) In Athens I dispatched of great heaping piles of yogurt with honey, while in Alaska I’d relish smoked salmon on Russian rye toast. 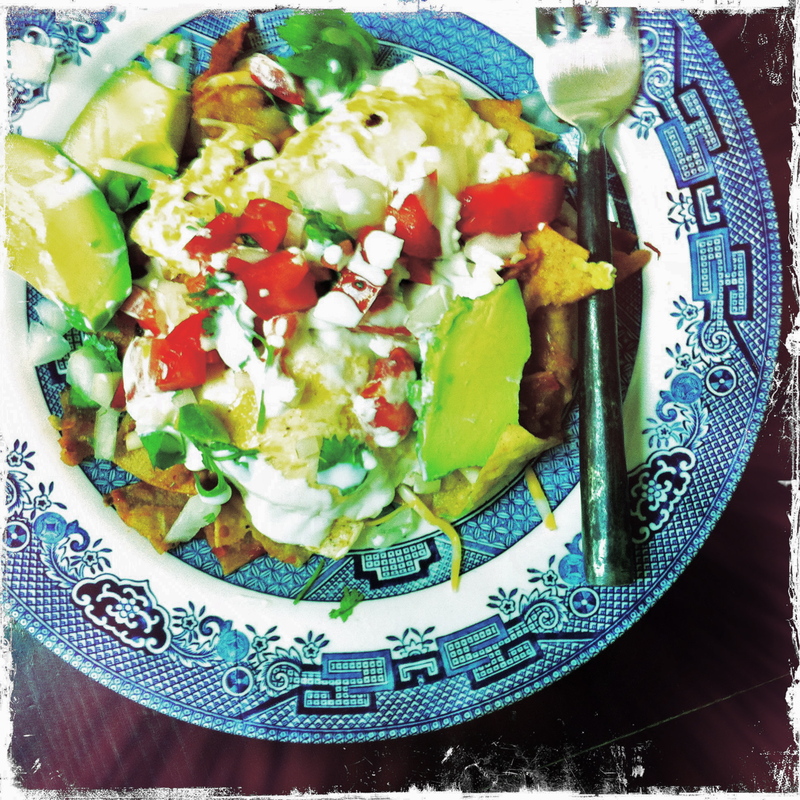 But the exotic breakfast that makes the most appearances at our own house has to be chilaquiles. While not as well known a breakfast dish in Mexico as, say, huevos rancheros or chocolate con leche y pan, you’d be hard-pressed to find a more satisfying dish on a Saturday morning — especially when you introduce a couple of farm fresh fried eggs on top! If you happen to be a bit hungover, as I often am on a weekend morning, it’s said that the dish is a recognized cure — “recognized” by whom, I’m not sure. But the spicy kick and the supple greasy undernote of pork chorizo will do you a world of good. The dish is a popular way in Mexico to use up stale corn tortillas. (You know I love that resourcefulness!) Most recipes call for frying strips of corn tortilla in oil — in other words, making tortilla chips. I’ll sometimes do this, if I’m trying to dispense of my own over-the-hill corn tortillas. But more often, what I’m trying to use up is tortilla chips I’ve bought at the carniceria that are getting a tad stale (Do not try this with Doritos. If you’re using tortilla chips, use good ones.). Like most dishes of this sort, there are countless regional varieties. Some like those of the central Mexico region call for keeping the chips crisp, while in Guadalajara a long-simmered version renders a polenta-like product. In Mexico City, they like a spicy tomato sauce, while in Sinaloa a light, creamy sauce is preferred. In truth there are probably as many versions in Mexico as there are cooks. Meanwhile, heat another large, non-stick pan and fry the eggs — one or two per person — until cooked to your preference. Scoop a quarter of the chilaquiles onto each of four plates. Sprinkle with chopped onion and chopped cilantro. Place an egg or two on top of each. Drizzle with a bit more salsa, and then top with avocado, tomato, crumbled queso cotija and a tablespoon of sour cream. Season to taste with salt and serve. Great simple dish. I was introduced to this by my cousin when I was in my teens and just loved it. Made it for my kids when they were little then forgot about it til a few years ago, then started making it again. What I love about it the most is that I always have the ingredients on hand. I tend to lean towards scrambled when I do make it as I like the crunchy tortillas intermingled with the soft pillowy eggs. That’s interesting… because if you do scrambled and intermingle egg with chip, you’re getting into matzo brie territory, which I love! I’ve had matzo brie, which i am not crazy about…not really the same.